Young people today are coming of age in the throes of a social and spiritual revolution. Indeed, it is indisputable that we are in an era of social and spiritual transition.Getting information from the web, articles, books, and newspapers; watching and listening to TV, radio, and documentaries; or even downloading webcasts –- we see and hear it described variously as a time of transition, crisis, or revolution, both within the church and in the world. One of the major goals of the General Board of Higher Education and Ministry’s Strategic Plan is to “reach young people to assist and support them in identifying and forming their vocations as Christians for leadership in the global church and the world.” At the same time, we also support those who have felt God calling them for many years, but only recently felt able to answer that call. Church and society in such a time of exponential change cry out for leaders with convicted moral and spiritual courage, excellence in preparation and training, and a compelling sense of mission or call. A time of transition, if not crisis, is one of the hardest times to be a leader. 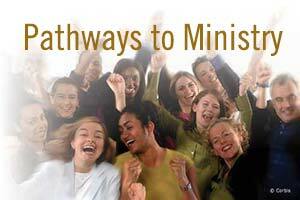 Wherever you are on your journey, we hope the resources, highlighted in the Pathways to Ministry pages will help you explore and answer God’s call. These pages will offer information about the types of ministry, where and to whom you can look for guidance, questions to consider, and links for additional information. If you are considering the path of an elder, deacon, local pastor, or chaplain, you will find descriptions of the work, the educational requirements, and the steps into ministry. God’s call never ceases! A growing sense of vocation always leads to more satisfying and effective life choices, and the need for Christian leaders never ends.